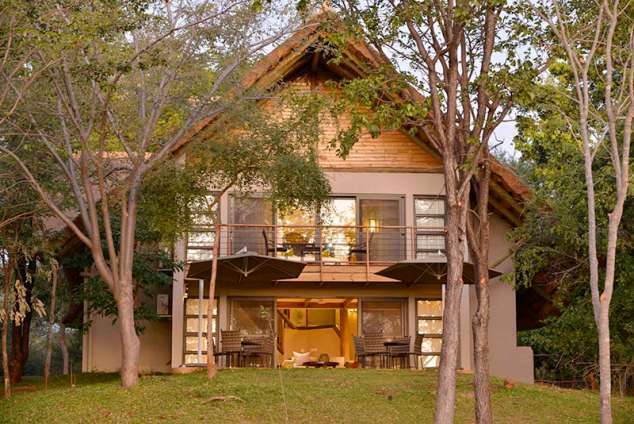 Victoria Falls Safari Suites - Victoria Falls Accommodation. The Club Suites offer luxurious accommodation with uninterrupted views of unspoilt bushveld and spectacular African sunsets. Safari Club residents have access to all existing services and facilities on the Victoria Falls Safari Lodge resort, but no other resort residents have access to the Club wing, thus ensuring total exclusivity. Ideal for families and small close-knit groups who seek comfort, privacy and space, the two and three-bedroom sunset-facing Safari Suites are set in a natural bush environment on the grounds of Victoria Falls Safari Lodge on the edge of Zambezi National Park and just 4km (2.5miles) from the Victoria Falls. Each of the six split-level Safari Suites is fully air-conditioned, boasting a Master Gallery Bedroom upstairs that affords a superb vista over unspoilt bushveld and spectacular African sunsets. The Safari Suites are all en-suite, with a spacious lounge and a private patio overlooking a small waterhole that attracts bushbuck, warthog and a rich variety of birdlife, and are within walking distance from the restaurants, activities and facilities of Victoria Falls Safari Lodge. A second lounge features a sofa bed, which can sleep one extra person (recommended for children under 12 years of age). Safari Suites facilities include digital safes, complimentary tea and coffee making facilities including a Nespresso machine,microwave and a complimentary mini bar (restocked daily with local beer, house wine, bottle water and soft drinks). All bedrooms are equipped with 2 three-quarter beds that can be converted to King size beds. Personalized check-in and orientation in the comfort of your Safari Suite by your Safari Hostess, who will explain the concierge services available. Breakfast for Safari Suites guests is served in the MaKuwa-Kuwa Restaurant located in the Victoria Falls Safari Lodge, with the option of a continental basket delivered to the Safari Suite (by prior arrangement). Breakfast daily at the Victoria Falls Safari Lodge in the MaKuwa-Kuwa Restaurant. Complimentary golf cart shuttle service around the resort. Complimentary tea/coffee making facilities, including a Nespresso machine. Complimentary mini bar restocked daily with local beer, house wine, soft drinks and bottled water. Resort activities on offer consist of hide sits, guided walks and nature trails. Additional activities may be booked at the in-house Activities Desk including white water rafting, canoeing, helicopter flights over the Victoria Falls, game drives, elephant interaction, sunset cruises, and gorge swings. Guests may use the lodge’s complimentary shuttle bus to visit the Victoria Falls Rainforest. The ‘Vulture Culture Experience’ occurs daily at 13:00hrs, below the Buffalo Bar viewing deck (duration is approximately 30 minutes). This is a conservation exercise to help maintain the local vulture populations, providing guests with a thrilling insight into the lives of these raptors. Complimentary shuttle service transports guests to the Victoria Falls rainforest and town centre on an hourly basis throughout the day. Complimentary evening shuttle to The Boma Dinner & Drum Show. Courtesy golf cart transfer service is available on request between the Safar Suites and Victoria Falls Safari Lodge. Private shower facilities for early arrival & late check-out guests located at Victoria Falls Safari Lodge. Swimming pool with sun deck located at Victoria Falls Safari Lodge. Curio and Gift Shop at Victoria Falls Safari Lodge. Baby sitting facilities on request by prior arrangement. 188 page views since 28 Mar, 2018. Last updated on 28 Mar, 2018.